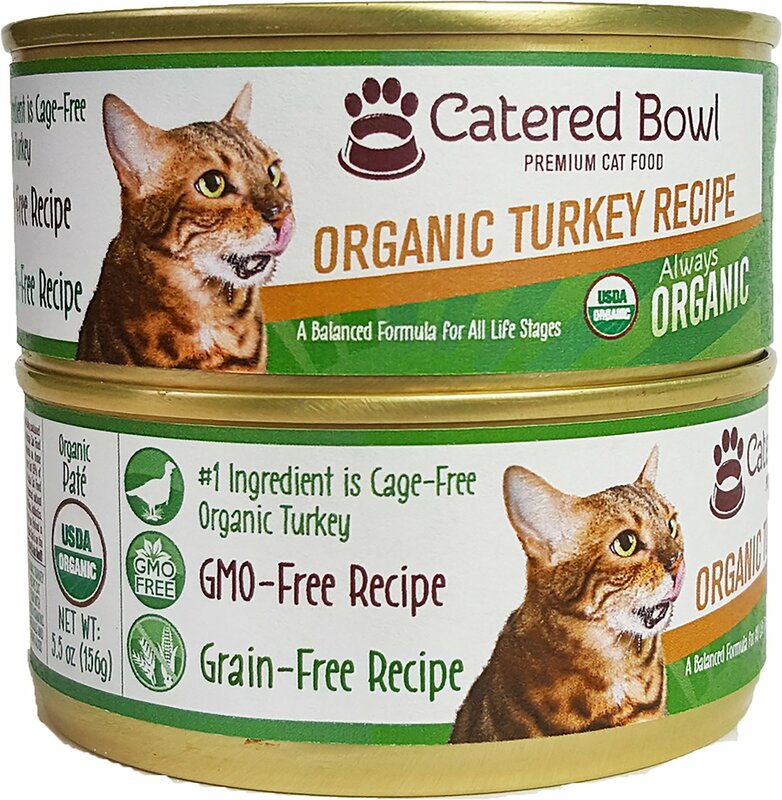 Feed your pet like family with the Organic Turkey Recipe canned cat food from Catered Bowl. Starting with organic turkey, this recipe is made with a precise blend of organic ingredients, antioxidants, vitamins and minerals. In short, it’s food with the same quality that you would eat—because your cat deserves nothing less. Every bite serves up complete and balanced nutrition that’s formulated by pet food nutritionists, and there’s never any added hormones or artificial preservatives, colors or flavors. First ingredient is USDA-Certified organic turkey sourced from US farmers. Made with turkey raised without cages and without antibiotics. 100% complete and balanced nutrition with added vitamins, minerals and other trace nutrients. Always made in the USA with no grain, GMOs, corn, soy or wheat or artificial colors, flavors or preservatives. For all cats throughout all life stages, from kitten to adult. Organic Turkey, Water Sufficient For Processing, Organic Pea Flour, Organic Dried Peas, Tricalcium Phosphate, Salt, Organic Yeast Extract, Agar-Agar, Calcium Carbonate, Salmon Oil (Preserved With Mixed Tocopherols), Choline Chloride, Organic Sunflower Oil, Organic Chicken Broth, Potassium Chloride, Taurine, Magnesium Proteinate, Zinc Proteinate, Thiamine Mononitrate, Iron Proteinate, Niacin Supplement, Vitamin E Supplement, Copper Proteinate, Vitamin A Supplement, Sodium Selenite, Calcium Pantothenate, Pyridoxine Hydrochloride, Riboflavin Supplement, Biotin, Manganese Proteinate, Vitamin B12 Supplement, Vitamin D3 Supplement, Calcium Iodate, Folic Acid. For adult cats feed 1 to 1 1/4 cans per day per each 7 pounds of body weight. For pregnant and nursing mothers and for kittens up to 1 year of age feed up to 2 to 2.5 times as much as for adults or up to 3.5 cans per day. The amount of food your cat requires will depend on activity, age, environment and breed. Feed at room temperature and refrigerate unused portion in a non-metallic container. Remember to always keep fresh, clean drinking water available for your cat. I have a 16+ year old gal and a 6 year old boy - neither of whom would touch this. I bought this in an effort to find a new option that both could eat without upsetting the old biddie's IBD and apparent chicken allergy. Beware that this is a pate formula, which I did not see listed in the description. Neither of my cats like pate, so after wasting 3 cans of this I gave up and donated it to a local shelter. Wished they liked this because I don't know of other organic options that are chicken-free.